Congratulations to all the winners of the raffle. 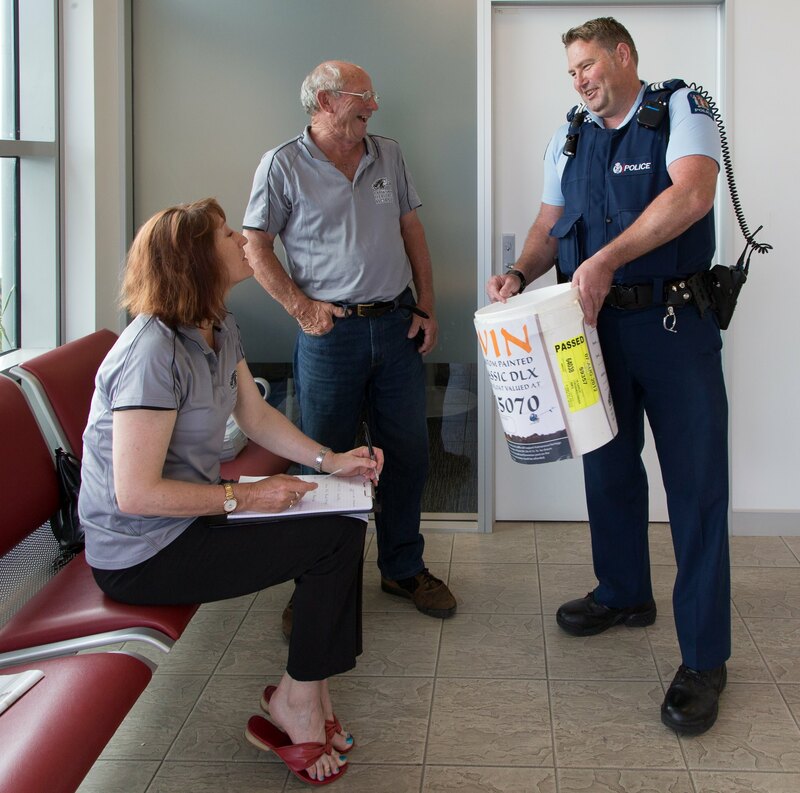 The draw was made at the Pukekohe police station, and all winners have been contacted. Thank you everyone who bought tickets. Thank you everyone who has been selling our raffle tickets, and for everyone who has purchased them. For the sellers, all raffle ticket books and stubs must be in the post no later than tomorrow, and all bank transfers need to be made. Please contact Elder on 09-236-4115 if you have any questions. The KHH Raffle tickets are on sale from the 24th September to the 18th December, and you don’t want to miss out. First prize is a Thoroughbred floats Classic DLX, valued at $15,070, and painted in your choice of colour. Second prize is a helicopter flight for two people over the Kaimanawa Ranges to see the horses. Other prizes include KHH branded merchandise, Equidays tickets, and a NZ Horse & Pony magazine subscription. After several days delay due to the weather, the muster is now finished, and the horses are arriving at their new homes. This muster DoC brought in 172 horses, and homes were found for 157. At the previous muster in 2012, 191 horses were brought in and 119 found homes, so this year has been a great improvement. Kaimanawa Heritage Horses would like to thank everyone who has been involved, the people who spread the word about the muster, all our generous donors and sponsors, and everyone who applied to get a horse. The next muster will be taking place in 2016. Over the next year we will be running the Kaimanawa Stallion Challenges, with selected trainers showing us what they can do with their wild Kaimanawas, and competing at Equidays 2014, and Horse of the Year 2015. You can read more about the Stallion Challenges here, and find links to where you can read more about the trainers and see what they are doing. And you can see more images and read about how the horses are doing by visiting our facebook page. Excitement is building as Kaimanawa Heritage Horses, in association with Equidays and Horse of the Year, launch the nation’s first wild horse challenges. There are only a few weeks until the wild Kaimanawa horses are mustered by the Department of Conservation, and the Major Milestone and the Stallion Makeover have attracted the interest of some of the nation’s most respected horse trainers. Nine trainers, representing five equestrian disciplines, have been invited to compete for $50,000 in cash and prizes. They vary in age and technique, but they all have one common goal – to showcase the versatility and trainability of the Kaimanawa horses. Each trainer will be randomly assigned their wild stallions, and then they will have just five months to prepare for the first performance. At Equidays the focus will be on the Thoroughbred Floats Major Milestone Halter Class. The stakes will be high as the trainers complete set workouts, release the stallions into a round pen before exiting the arena and then re-haltering the horse, followed by a freestyle performance which is expected to rival the standard set at wild horse challenges internationally. Four months later the trainers will return to the arena, this time at the prestigious Horse of the Year show, to compete in the Saddlery Warehouse Horsemanship Class, Thoroughbred Floats Obstacle Challenge, and the WashBar Freestyle, each worth thousands in cash and prizes. More importantly, the points gained in each of the specialty classes will qualify them to compete in the Stallion Makeover where the top ranked horses will battle it out in the Premier Arena during the Friday Night Extravaganza with a sizable purse on offer for the finalists. Between 18 and 25 stallions will compete, and KHH are looking for expression of interest for additional trainers. The ‘invitation only’ event has wild card spaces available, so if you know of anyone with the experience and facilities to rehome newly mustered stallions, then please contact events@kaimanawaheritagehorses.org. There is a rigorous approval process involved, and we expect these final positions to be hotly contested. We would like to say a huge thank you to the equestrian companies that have partnered with our horses, and we will be announcing the naming right sponsor of the Stallion Makeover in the weeks leading up to the muster. The Saddlery Warehouse is one of the sponsors of this year’s Kaimanawa Heritage Horse stallion challenge. “This event embodies the values that we hold dear at the Saddlery Warehouse” said Warren Brewin, CEO. “We like the spirit of human endeavour to firstly save the horses, and then to develop them into a sensitive, yet hardy, equine partner. The trust that is built between the Trainer and the stallions is akin to the way we endeavour to develop our business through every step of the supply chain, from the original source manufacturer to our Freight Forwarders, our Warehouse personnel, our Retail Franchise Network, and ultimately to our end Consumer”. “We wholeheartedly support the Challenges and wish the Trainers and Kaimanawa Heritage Horses every success in their program to protect wild herds and inspire future generations to love wild horses”. KHH is also excited to announce Horse & Pony Magazine as the official media partners for the Stallion Challenges. A monthly column will follow the muster, both events, the trainer’s progress, and the winning stallion will feature on a cover of the magazine.